Nature have given palamau many gifts of medicinal plants.Tribes have been familiar with their properties and use them to be healthy in all adverse conditions.birhore,korwa,asur and other primitive tribes live in malaria zone of jharkhand and availability of these medicinal plant decides their fate in dense forests.GUMA common name is a plant which is normally considered as a weed in rabbi crops. Leucas cephalotes (Roxb.) Spreng, Labiatae. 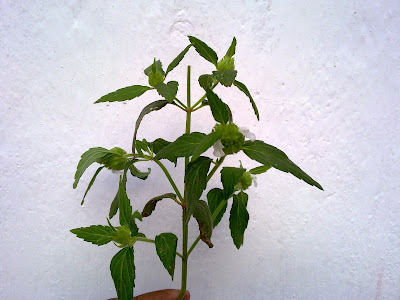 is one of the common weeds found in Central and South India. It is upland rainy season weed. In India, it is commonly known as Dronpushpi (Dron = bunds, Pushpi = flowering plant). It is commonly occur in Drona (earthen berm). Other names in different Indian languages include Barahalkura (Bengali); Gubo, Kubi (Gujrati); Dhurpisag, Guma, Gumma, Goma (Hindi); Devakhumba (Marathi) and Peedalumni (Telugu) (Krishnamurthy, 1993). The genus Leucas includes about 100 Asiatic and African species. Common species found in India are L. aspera Spreng., L. linifolia Spreng, and L. uritcaefolia R. Br. (Caius 1986). Although Dronpushpi is a problematic weed for farmers, it is a tasty potherb for many rural people and a valuable medicinal herb for herbalists and is cultivated for herbal drugs in some parts of India. In village markets. Dronpushpi can be seen easily in rainy season. (Oudhi 1999, 2000; Oudhia and Tripath 1998, 1999, 2000; Oudhia et al. 1999). In tribal regions of India, Dronpushpi is a valuable drug for snake bite. a property reported in ancient Indian literatures, and is used both externally and internally. In many parts of India, people plant this weed in front of their homes to repel snakes and other venomous animals. The juice extracted from leaves is used to cure skin problems. In rainy season, many Indian tribal communities take bath with water having Dronpushpi leaf extract. They also wash their cattle and other domestic animals with this water. According to Ayurveda, the plant is mild stimulant and diaphoretic and used in fevers and coughs. The flowers mixed in honey is used as domestic remedy for cough and colds (Caius 1986). The seed also yields medicinal oil. Labellenic acid (Octadeca – 5, 6-dienoic acid) has been reported in seed oil. Beta sitosterol have been isolated from the plant of Leucas cephalotes. Anti bacterial activity of Leucas aspera leaf extract against Micrococcus pyogenes and Escheria coli have also been reported (Rastogi and Mehrotra 1991). Dronpushpi is valuable homoeopathic drug and as such is used for the treatment of chronic malaria and asthama (Ghosh 1988). In many parts of India particularly in North India.